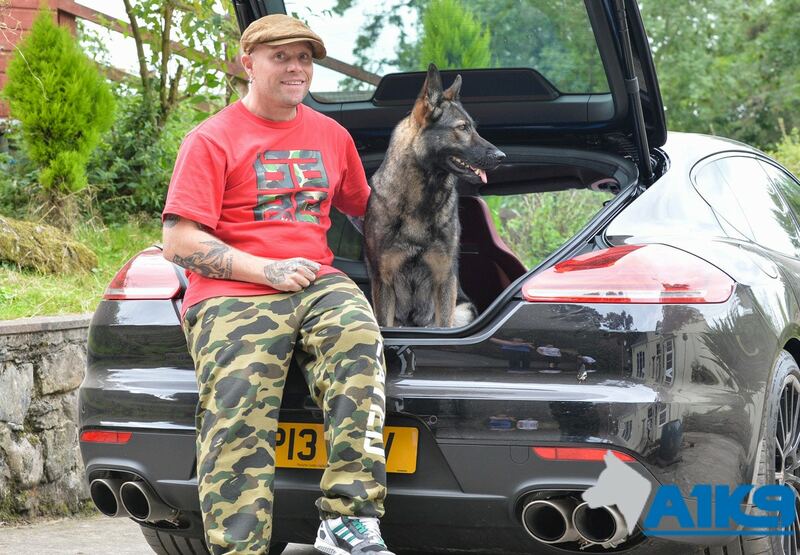 Whether you are located in the UK or in another country, our trainers will work alongside you, tutoring and advising on all aspects of owning your new A1K9 protection dog. After successfully selecting your new A1K9 personal protection dog or obedience trained dog, follows the all-important handover. We insist on a minimum of a two-day handover for all of our trained personal protection dogs, or one day in the case of one of our obedience trained dogs. This is where you and your family get to spend valuable time establishing an initial bond with your new dog, whilst being shown by our experienced trainers how to master, control and care for your new friend and k9 protector. It is usual for our protection dog handovers to take place at our facilities; however, we can on request arrange for the handover training to take place at your home, whether that is at a location within the UK or abroad. We are very flexible and will go out of our way to make the process as easy as possible for the client. This dog and owner familiarisation training is designed to help you form the initial relationship with your new protection dog as well as to provide a valuable insight into both the dog's training and capabilities so that by the time the handover is complete, you and your family feel at ease with your new A1K9 and equally, your new canine companion recognises you as its new master. 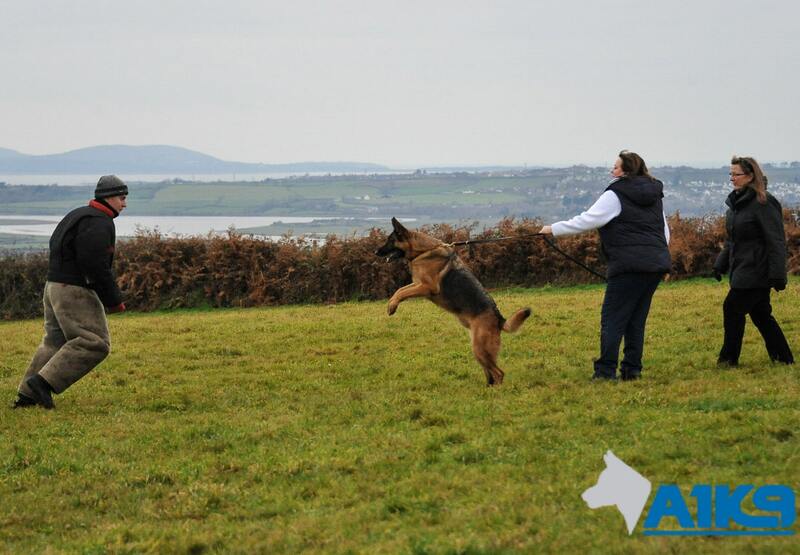 The handover training is structured into two main parts: obedience and protection work. Training The New Owners During Our Structured Handover Is One Of The Most Important Parts Of The Entire Purchase Process. Typically, you will go out for an accompanied walk with the dog and its trainer, during which time you will be given an overview of the obedience training the dog has received and be shown the basics of how to handle the dog yourself. You will be shown the correct way to use the equipment such as the lead and collar. Whilst this might sound simple, this initial training forms the foundation for the handover process and dog owner relationship in the years to come. Then it is time for a little fun; playing ball with your dog is a great way to get to know each other and is the beginning of a lifelong friendship. After a break you will have the opportunity to take your new companion out on an unaccompanied walk to try out the new skills you have acquired, practising simple commands such as 'sit', 'stay', 'down', and getting your dog to walk to heel. Before the day ends you will be shown how to groom your dog correctly, what brushes you should use for what and when to use them. This is also a great way to bond with your dog and will help you to keep your beautiful dog in peak condition. Normally, by the end of day one, your new dog will be happy to take commands from you and the start of that all-important bond with your new protection trained family canine companion will be well under way. Only When You Feel Totally Comfortable and Confident With Your A1K9 Protection Dog Is The Handover Complete. It is only when you feel 100% happy, confident and competent with your A1K9 trained personal protection dog that the handover is complete. In the morning, you will take your dog for a walk unaccompanied, which will give you an opportunity to practice what you learned the previous day. Now you have your protection dog paying attention to you and you feel more confident handling him / her, it is time to move on to the next phase of off lead obedience and control, such as getting the dog to stay in one place and the all-important recall - how to get the dog to always come back to you. When this is completed, you will be shown the personal protection work that the dog has been trained in. In this final stage of the handover you will be taught how to use the dog to deter a potential threat and ultimately, how to handle the dog whilst it deals with and neutralises a physical attack against you. We will enact different scenarios, during which you will be tutored in the best methods to employ, to keep yourself safe if you are put in a situation where you need to use your dog to protect yourself from a threat or potential attack. This is so you understand how to use the dog to its optimum efficiency when dealing with a hostile situation, even down to the importance of maintaining your positioning relative to the threat, keeping yourself behind the dog. Customers are usually amazed by our protection dogs' abilities to change roles as the situation dictates. It is a particularly exciting time in the training and many of our female clients feel a great sense of empowerment when being confronted by a large man or group of individuals, knowing that they have a highly trained A1K9 protection dog by their side that will definitely equal the odds. It is only when you feel 100% happy and are confident and competent with your A1K9 trained personal protection or family protection dog that the handover is complete. It goes without saying that our after sales support and service to our customers continues throughout the lifetime of the dog and many of our protection dog customers not only elect to send their A1K9s back to us for periodic refresher training but also visit us with their dogs to brush up on their own handling skills and enjoy a cup of coffee and a chat. We build up a very close rapport with our clients, many of whom like to stay in touch. We Recommend Periodic Refresher Training For Our Dogs To Keep Them At The Top Of Their Game and Many Owners Like To Brush Up Their Handling Skills Too. At A1K9, as part of our commitment to our customers we provide the facility for them to bring their A1K9 trained personal protection dog back for periodic refresher training. A chosen option for many of our clients is to book their dogs in for some brush up training whilst they are on holiday, enabling the dog to return to a familiar place, to people that it knows and where it will be put through its paces to sharpen up on both its obedience and protection skills. This is something that could not be achieved by just booking the dog into a regular boarding kennel. In much the same way as if one owns a performance car, you would be unlikely to entrust it to just any garage. When the dogs return to us they are given a couple of days to settle back in to kennel life, during which time they will be walked and exercised. They will be assessed and where areas of their performance are found to be lacking, a training regime will be set to concentrate on bringing the dogs training back up to speed whilst they are in our care. In much the same way as people can develop bad habits, so can dogs if they are allowed to. One of the most common problems that we have to address is where an owner has allowed the dog to get into the habit of walking in front or pulling on the lead, or breaking its stays. Things like this can be quickly rectified when the dog comes in for its refresher training. We recommend periodic refresher training, to ensure that our customers trained protection dogs are kept on top form. It is a service that is very popular and some clients like to brush up on their own skills too, when collecting their dog. One would hope that the dogs that we supply will not have to use their protection skills. We have seen a number of dogs that have not been returned to us for any training for three or four years from the time they were purchased, and they do not forget this training; but like humans may become rusty when this aspect of their original training has not been utilised. In brief, our refresher training courses are in place to protect your investment in one of our highly trained dogs and to enable the dog to continue to fulfil its role as both an obedient family pet and protector. Regular refresher training for your dog is the key to keeping its obedience and protection training fresh in its mind. If the client prefers, refresher training and bespoke on-site training can be carried out at their home location, for details, please call us and we will be happy to help.